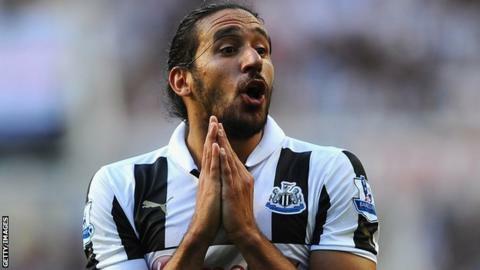 Newcastle midfielder Jonas Gutierrez has thanked fans for their support after revealing he is being treated for testicular cancer. The 31-year-old had an operation in his native Argentina to remove his left testicle after the discovery of a tumour, and is undergoing chemotherapy. "Thanks for all the messages. Always looking forward," he wrote on Twitter. Gutierrez, who was on loan at Norwich last season, has scored 10 goals in 177 league appearances for the Magpies. The former Velez Sarsfield and Mallorca player revealed his illness during an television interview in Argentina on Tuesday. "I detected a tumour in a testicle. When I confirmed the cancer, I went home crying," he told TyC Sports. "I came here and I assumed the costs despite having a contract with Newcastle. "Money is not important. What is important is health. I had to start chemotherapy." In a statement, Newcastle said: "The club has been aware of Jonas's condition for some time but has respected his wish for privacy as he undergoes treatment with his friends and family around him." There has been widespread support from past and present players for the Argentine. Former Everton defender Alan Stubbs has twice battled cancer and was first diagnosed with testicular cancer in 1999 as a Celtic player. He said he was surprised and saddened to hear the news and gave an insight into what Gutierrez would be facing right now. "He'll probably be on a roller-coaster of emotions.," Stubbs told BBC Sport. "It will have been a real shock when he was told the news. It takes you to places you don't want anyone to go to because it can really have a negative impact on you. "But the success rate in testicular cancer is so high." Former Arsenal and Wales striker John Hartson, who has also battled testicular cancer, said: "This is sad news, and my thoughts and best wishes are with him. "The fact that he's had an operation and is undergoing chemotherapy sounds like it's been detected early." Gutierrez's Newcastle team-mate and striker Adam Campbell tweeted: "Just come round from my op and been smacked right in the stomach after hearing about a great man Jonas Gutierrez being ill, keep strong bro." Former team-mate Joey Barton tweeted: "Heard the terrible news. Wish him a speedy recovery. Great guy with a great family. My thoughts are with them all." Former Millwall striker Neil Harris, Northampton goalkeeper Matt Duke and ex-Tottenham and Chelsea defender Jason Cundy were successfully treated for testicular cancer and resumed playing.